Do Ball Chairs Offer Benefits? Q : I know sitting at a desk all day is really bad for me. Is sitting on an exercise ball any better? A : Unfortunately, the answer seems to be no. 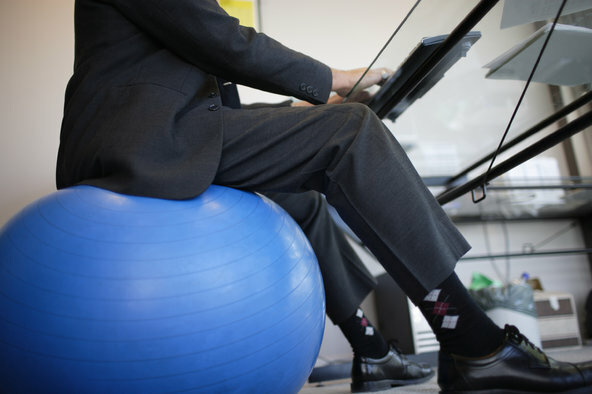 “To be quite frank, I cannot see any advantage or reason for a person to be using an exercise ball as an office chair,” says Jack P. Callaghan, who holds the Canada Research Chair in Spine Biomechanics and Injury Prevention at the University of Waterloo in Ontario. Although you might expect that sitting on the ball would demand extra exertion to keep you upright and stable, when Dr. Callaghan and his colleagues had healthy young volunteers sit alternately on a ball, an office chair and a backless stool while machines measured muscle activity in their abdomens and lower backs, they found no meaningful differences in the seating options; sitting on a ball did not provide a mini-workout for the midsection. Ball chairs do not improve posture, either. Research by Dr. Callaghan and others have shown that people generally slump just as much on a ball as in a normal chair and that back pain is not reduced. And, in part because sitting on a ball chair involves more contact area between the seating surface and your backside than a chair does — you sink into the ball somewhat — many new adopters of ball chairs report increased discomfort in their backsides. If your concern is with sitting too much, a better solution is probably to stand up periodically throughout the workday, which has been found to improve health. Prop your keyboard on a shelf or filing cabinet and type upright. Or stand when you make phone calls. But don’t overdo the standing, Dr. Callaghan says. Many people experience back pain if they stand for two hours or more at a workstation, he says. Aim, instead, for perhaps 15 minutes upright each hour. Comments Off on Do Ball Chairs Offer Benefits?